In the course of attending the SXSW conference, I had the pleasure of listening to the amazing Kathy Sierra speak. In her session, "Making Breakthroughs Happen" she asked the audience to consider our clients or customers and try to answer the question "If your customers were living a movie, what movie would that be?" The question stimulated a lot of chatter. I was instantly stumped, as the ever saucy Valeria Maltoni quipped "I don't know WHAT movie - but it would be a scary one!" Hoover's Tim Walk decided on Glenngary Glenn Ross and highlighted the high pressure sales situations some of his clients are in. Before Lauren Vargas could speak (I'm sorry Lauren), I blurted out the movie title that had invaded my brain -- even though it made no sense at the time. As we explored it, we were intrigued by the association. 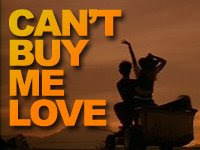 The movie was Can't Buy me Love. For those who haven't seen it, or don't recall, Can't Buy Me Love is a 1987 hit teen sensation starting Patrick Dempsey as Ronald Miller. Ronald is an awkward, lawn mowing nerd who is sick of being unpopular as he enters his Senior year. Capitalizing on a personal crisis, he successfully convinces the very pretty, popular, lead cheerleader Cyndi Mancini to be his boyfriend for one month, in exchange for $1000. They get off to an awkward start, but as Cyndi begins to work on Ronald, a friendship ensues. Ronald's popularity soars through his association with Cyndi and she truly begins to develop romantic feelings for him. However, new found popularity causes Ronald's head to swell, and he begins to behave badly. Ronald soon realizes that chasing popularity isn't all it is cracked up to be -- especially as he loses girl he cares for. Toward the end of the film, Ronald has an awakening that speaks to his need for internal change: the need for authenticity, being true to himself, demonstrating character and care for others. This realization prompts a return to the basics for Ronald. In the final scene of the movie, the redeemed Ronald rides off into the sunset on his lawnmower...and Cyndi joins him, perching on the back. Now, I hadn't seen this movie in eons - and I can't say it was ever in my list of top 80's movies - or even top-of-mind. However, I was a bit surprised by the parallels I noted between this movie and many of the companies I've been exposed to. Like Ronald, many companies courting customer popularity go out and hire the best and most charismatic to help them in their plight: Expert agencies develop brand plans and multichannel, experiential campaigns filled with promise. Large consultancies support them in purchasing and leveraging the leading CRM and marketing automation tools. 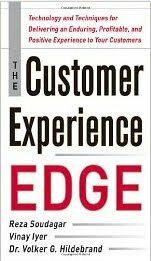 As they team with the experts, these companies begin to speak the language of customer centricity. They begin to make adjustments and changes. They also learn some new dance moves, network in new channels (such as social media) and apply spit, shine and polish that can make them more attractive and popular. This is certainly a start, start, but the action can't stop there - and it often does. For the story to end happily, there must be a moment-of truth that leads to truly redemptive, internal change. True customer is hard work that demands some tough introspection and internal change! Unfortunately, when it comes to addressing the internal operational, cultural and organizational issues that negatively impact customer centricity, many companies haven't yet turned a corner. When it comes to creating truly seamless, integrated experience, there's often no plan in place, and no executive mandates or alignment to ensure the total experience is being addressed. As a result, the customer experience suffers, relationships are impacted and brand equity suffers. 76% say employees are not well-versed in how to delight customers. What's ironic about this data is that, between 82-85% of the same executives agree that Customer Experience is the next competitive battleground! Taking a look at how companies stack up, perhaps this inconsistency is the reason MOST organizations fall horribly short of customer experience excellence. The fact remains that the problems present in our companies related to culture, operations, strategic planning and programmatic execution are almost always reflected at some level in the the customer experiences we offer. The message should be clear for us all: We can't buy customer love. It comes only from offering authentically great experiences. This requires really hard work - unglamorous work - but this is also the work that pays off the most in the long-run. Customer centricity is driven out of organizations that truly understand and engage with their audience, deliver operational excellence, support an open, responsive culture and drive customer-centric collaboration from the top-down. In short, they are agile, transparent, creative, responsive and engaged, and they deliver consistently solid, positive experience. Perhaps it's time for your company to have a Ronald Miller experience. It wasn't an easy journey - and it involved a fair amount of humiliation. Realigning an organization from a silo-driven, product-focused culture to a truly customer-focused alignment isn't for the faint of heart. It requires solid, cross-organizational top-down leadership, dedication to knocking down organizational and collaborative barriers, appropriate strategic planning, a transformation in the culture and a better orchestrated and collaborative enterprise. However, at the end of the story, it's the heroes that take on this work that will ride off into the sunset with the customer.